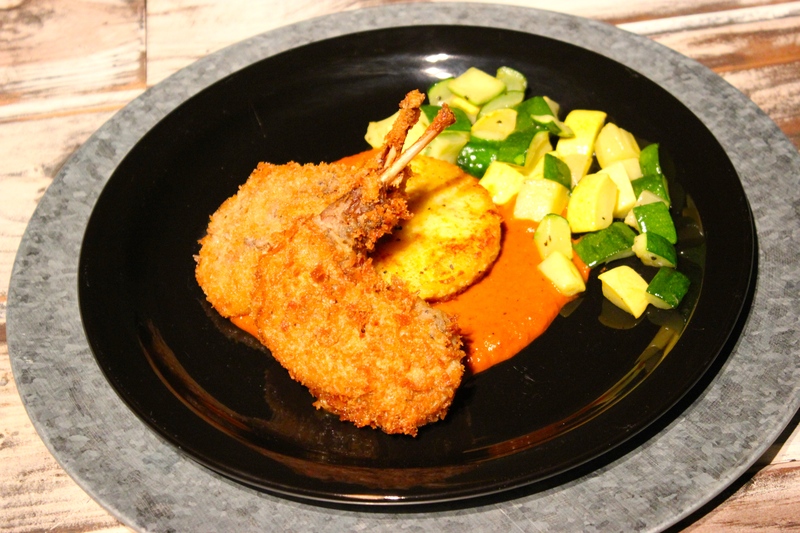 With such low fat, wild rabbit is notorious for being tough and stringy, but a low slow poach in the Sous Vide Supreme water oven makes it tender, and retains all the flavor. Add coating and a quick deep fry and this dish will beat fried chicken, hands down!! Served with fried polenta cakes and smoked red pepper cream sauce, this dish will knock your socks off! Make a dry rub with the allspice, cardamom, salt, pepper, and pink peppercorns, and rub into the rabbit legs. Place the rabbit in a large vacuum bag and add all the remaining ingredients. Vacuum seal and place in the fridge for 12 hours (*It's recommend but you may eliminate refrigerating overnight and continue with cooking). Heat the Sous Vide Supreme to 170ºF/76.6ºC. Add the bag and set the timer for 10 hours (the time/temp is for wild rabbit, not farm raised). Once the timer goes off, remove the rabbit from the Sous Vide Supreme and cool the bag immediately in ice water. Refrigerate overnight or if deep frying right after, just cool the bag in ice water for 10 minutes to firm up the meat a bit. Bring the vacuumed sealed cottontail to room temperature by removing it from the fridge 1 hour ahead of frying. Beat eggs in a wide rimmed bowl, set aside. Add flour and cayenne pepper to a plate, set aside. Add Panko to a large plate, set aside. Heat the oil in a deep fryer, or a pot on the stove with a thermometer, to 350 degrees. Remove the rabbit legs from the vacuum bag and pat dry. Break off a small piece of rabbit to check for any additional salt or pepper, and re-season if needed. Once the oil is heated, coat the rabbit in this order: flour, shake off excess, then dip in egg, then coat both sides in panko. Add a piece at a time to the deep fryer for about 30 seconds per side to set the coating. Add the pieces to a baking sheet and place in the oven for about 15 minutes to heat through and until the side dishes are ready. For the polenta cakes: I made medium grain polenta then poured it into a greased glass baking dish and refrigerated, overnight. Then heated a frying pan with oil. Cut out the polenta with a ring mold, dusted it with flour, and quickly fried until crispy and golden brown.